to be hooked up to the chemotherapy. She does not want it anymore. Early in October 2013, the entire nation heard about how Sarah Hershberger, a 10-year old Ohio Amish girl with leukemia (now recovered), is being forced into a two-year unproven experimental chemotherapy study by Akron Children’s Hospital (ACH). It was just learned the parents, Andy and Anna Hershberger, took their significantly recovered daughter out of the United States before the court ruled that a hospital-affiliated, attorney-nurse, Maria Schimer, was made the medical guardian to make sure Sarah will get her treatments. Parents reported this week the child is fully recovered through natural treatments. Schimer is General Counsel (chief legal advisor) for Northeast Ohio Medical University (NEOMED), a close affiliate and business partner of the hospital. According to Andy, Ms. Schimer has never met Sarah or him and his wife and they were never told their child was being used in a research study - among other things. Although they do not know it yet, the hospital now has a big problem they must deal with. Sarah is completely recovered, as of October 23, according to Andy. The hospital told them and the news media that Sarah would die in a few months without the treatment they recommend. Three doctors that have treated her with a natural, biochemical protocol using nutrition, supplements and plant extracts have declared Sarah cancer free based on cat scans and blood tests - confirmed three times. Of the 100s of stories and broadcasts, the local and national media failed to investigate the story behind the story - the side of parents Andy and Anna Hershberger and the grandfather, Isaac Keim, a bishop in the Amish church. "after the news media took only a part of my statements and twisted them, I wasn’t going to talk anymore." He and his family were happy and thankful that the Journal took the time to hear their side - never told before. 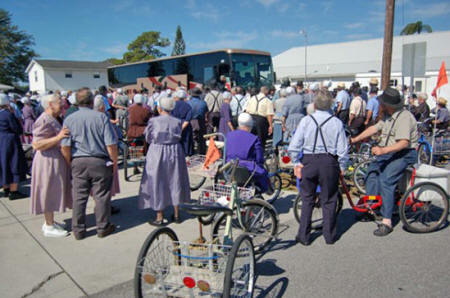 Amish people gather throughout Ohio and elsewhere to hear about Akron Children’s Hospital and the story of the Hershbergers. The Hershberger family says they never were told the chemotherapy was part of a research project using experimental chemicals. They also said the hospital did not get their signature for the second phase of different chemicals and only Sarah was asked to "put her name on the line." They claim they were not told of the serious side effects. They said Sarah’s confidential medical information was given to the news media violating federal privacy laws. After a significant improvement in killing the cancer, they saw that the chemo was starting to kill Sarah and decided to stop the treatment and employ a better option to stop the cancer altogether. This is when the hospital took legal action to keep Sarah in the treatment study. During the four-month ordeal, besides the anguish and financial losses Andy suffered a serious traumatic stress condition disabling him for three weeks. Family and friends helped with the kids and the vegetable harvest and sales at their produce stand and the nearby auction. Now the Hershbergers want to return to the United States, come home to their six other children in Medina County Ohio and put their lives back together after what they describe as gross mistreatment by the hospital. They want to come home without the fear of arrest for contempt of court. "he will not comply with the court order." It took four hearings and four judges to appoint the guardianship. The first appeal was challenged by the hospital’s legal team of four attorneys, but the appellate court refused to hear it and it was transferred to a different appellate court that ruled in favor of the hospital sending it back to a newly appointed judge in the county probate court which ruled against the Hershbergers, giving Schimer medical guardianship. The hospital told the family and the news media Sarah would die in a few months without their treatments. Isaac Keim, the Amish bishop, said Akron General Hospital told him the same thing a year ago when he had cancer. He refused chemotherapy and took a more natural approach and he feels just fine. He knows other Amish people still living healthy several years after they were told they would be dead in a few months if they did not accept the cancer treatments being recommended. ACH will lose as much as $1,000,000 or more by not treating Sarah the full 110 weeks in this study and, according to our sources close to the case, has already billed $130,000 for the first five weeks. Add to this the various pediatric cancer research grants and other funds it is receiving directly or indirectly for this type of study. ...all common for those that survive chemotherapy. Isaac Keim has said the Amish community in Ohio is turning away from the hospital and its 80 area locations. Many of them are now going elsewhere, he says. Andy says the hospital will not want people to hear about how they have been mistreated and especially the fact that Sarah is fully back to normal now - just in about two months. This is not a religious issue; the Amish accepts modern medicine - as did the Hershbergers wanting Sarah to start chemotherapy. This case is about the rights of good parents having the freedom to choose other treatment options that are less expensive and possibly more effective. This case is about the power of corporations over individual rights to decide which medical treatments and experiments for children and adults must undergo. Isaac Keim, by his authority as bishop of an Amish church, has declared the Amish church is against the court ruling and the actions by the hospital. He said he knows of many Amish bishops in the other churches who believe the same. Why is the hospital going to all the time and expense, even with the risk of tarnishing their reputation, all to make sure their advice is taken as opposed to other available treatments widely known in Europe as well as clinics in the U.S.? 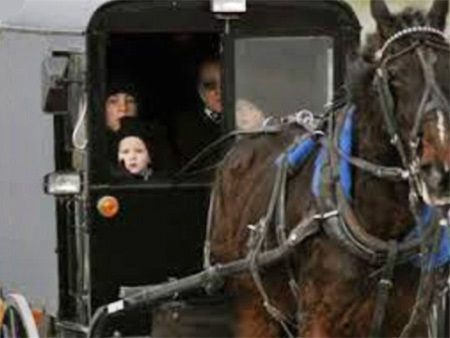 After all, these are Amish people, and it could become an extremely costly public relations nightmare. ACH and NEOMED may have banked on the Amish to stay quiet and not talk to the outside world, knowing also the Amish does not sue in court thereby making more information public. For this investigative report, the Journal had to delve a little deeper into ACH and NEOMED concerning the business of cancer treatment and research. National Cancer Institute (NCI) lists 39 different and ongoing cancer trials at ACH each with a number children. ACH has revenues of $700,000,000 per year, 60% of which are Medicaid billings and other government agencies, according to their annual report. They are currently building a bond-funded $250,000,000 expansion for additional rooms and treatment facilities. The ACH doctor over Sarah’s case practices part-time at ACH and four other Ohio hospitals. He (Steven Kuerbitz M.D.) is the Professor of Pediatrics at NEOMED. At issue in this case is whether parents have the sole authority for medical decisions about their children and the power of corporations line ACH forcing unproven experimental treatments. "when it is the best interests of the child." This is the principle on which ACH attorneys based their appeal. How is it that a hospital whose primary interests are the profits from expensive procedures be an objective opinion or argument on what is in the "best interests" of the girl? How is it the Court would give over medical decisions over to a hospital affiliate business partner? What does the court decision mean for any person bringing a family member into a hospital who does not agree with the treatment decided on by their panels of experts? Do they risk legal actions for having a different opinion even if based on another medical opinion? Do they risk losing custody of their child? It is most likely that legal proceedings will continue in reversing the second appellate court’s decision based on constitutional grounds. ACH and Ms. Schimer woes may just be beginning: they may be taken into the courts. Last week, the Journal was told that a powerful legal association specializing in constitutional law and individual rights may getting ready to defend the Hershbergers and reverse the decision. Now that Sarah has recovered, the Hershbergers want to return to the United States.